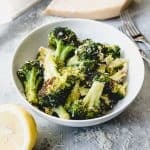 Oven Roasted Broccoli with Parmesan and Lemon is a delicious and healthy side dish recipe that goes great with almost any meal. Roasting broccoli in the oven is so simple and easy that anyone can do it and it always turns out perfectly, with light, fresh flavors from the Parmesan, lemon, and garlic. Preheat the oven to 425 degrees F. Wash and trim broccoli into florets and stems. On a large baking sheet, sprinkle the broccoli minced garlic, then drizzle with 2 tablespoons of the olive oil and season with salt and pepper. Toss to coat evenly. Roast broccoli in the oven for 14-18 minutes, tossing halfway through, until lightly browned on bottoms or around edges and the broccoli is tender-crisp. Transfer roasted broccoli with garlic to a bowl and toss with remaining olive oil, lemon juice, and Parmesan cheese. Taste and season with additional salt or pepper as needed. Serve immediately.